shuttle, is about the size of a DC-9 jetliner. It has three main sections. The forward fuselage holds the crew cabin, with the llight deck. The mid fuselage houses the payload (cargo) bay and robot arm (Remote Manipulator System). 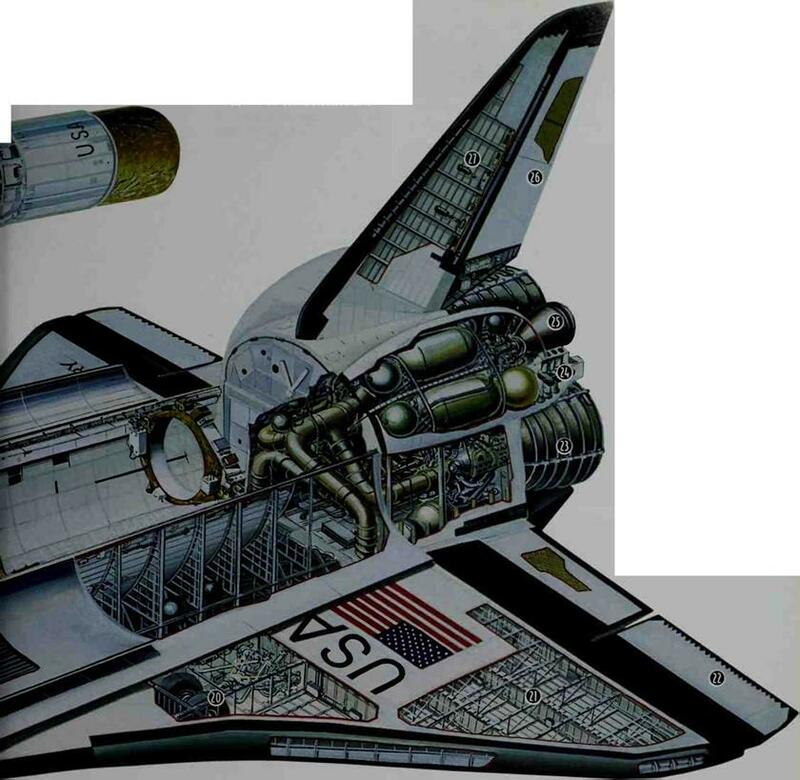 The aft fuselage has the vertical tail, three main engines, and orbital maneuvering engines. The crew of five to seven sleeps, eats, and cooks in the cabin mid deck below the flight deck. Crew members float about, moving between the decks through two hatches. The galley, or kitchen, contains a large variety ol foods. The astronauts take turns preparing three meals a day for the crew. The payload bay is not pressurized. To enter it. the astronauts go into an air lock. There, they change into space suits. Then they can work in the bay or outside the ship. The payload bay can hold over 60,000 pounds, or 30 tons, of cargo, including space station parts, satellites, telescopes, Spacelab, a portable science laboratory, or other equipment.